Well, Annie’s Costumes has agreed to do a giveaway almost every month. YEAH!!!!!! Lets all say thank you! Mardi Gras just happened right? Still going on? I’m really not very sure about Mardi Gras and all the details. That is the beauty of the Internet right? U.S. states of Alabama, Mississippi, and Louisiana. city. By 1720, Biloxi had been made capital of Louisiana. So, Mardi Gras is over but the fun doesn’t have to be. Do you like party masks? I do, of course, I told you in my last Annie’s Costume giveaway that I love costumes. I have this beautiful dress that my grandmother made for me. She made the top bodice piece of the dress completely by hand. It is beautiful. She cursed me and said she would never make me another dress again, (she still loves me) It was a lot of work, anyways, I love to wear a mask with it. In the past I made one by hand, so i would have loved to have gotten a mask from Annie’s Costumes. You can win one! That’s right, you can win one. I recommend you pick out your Easter costume while you are there. 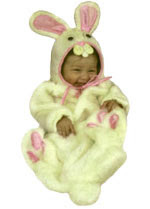 They have the cutest baby bunny outfits and some of them are on sale. Visit Annie’s Costumes and pick out the mask you would like. Please leave a comment for every entry contest ends March 31..
omg i love lvoe love the Hana Mask!! My niece would like the black and silver cat mask. Thanks for the chance. I absolutely love the Spanish Rose so I would have to pick that, Thanks! Simply because I think it’d be funny to randomly give to my friend, while still being a nice gift, I’d like the White Venetian Full Mask with Hat. Liz would have alot of fun with the White Blume Mask. 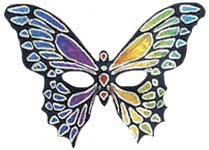 The “Coming Out” Butterfly Mask is mysterious and gorgeous!! Thank you for the contest! I really like the White blume mask!! Thanks for the chance. I ~love~ the Gold Butterfly mask. I would love the Catalina Mask! Shari from AnniesCostumes & Mommy Blogger too! OMG that baby in the bunny suit above is too cute. i like the White Bride to Be Mask! I like the Black cat mask. My daughter spends almost all day every day pretending to be a cat she would love this! I like the black and silver cat mask or the silver glittered butterfly. Thanks for entering me! 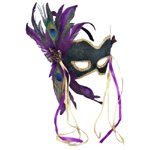 I would like the A670-GM mardi gras mask with the eyelashes! Thanks for the Annies Costume giveaway. I like the black and silver cat mask. I like the Pheasant Bird Mask. I have a passion for costumes and masks. I once was the Jester for Fasching in the town I used to live in. That was a fun event! This was NOT an easy task. I had to look at every single mask offered. I was drolling over so many of them! I finally decioded on the White Venetian Full Mask w/ Hat. I like the Purple Spanish Lace Mask. I like the Fiesta Multicolor Mask. Thanks for the giveaway! Added your button. It’s beautiful! Christina – xristya@rock.com – I love the Roxanna Mask, black with red roses! i like the cabaret mask. I like the Hana Mask! I really like the Caribbean Butterfly! I like the Butterfly mask! I would choose the Red Deluxe Sequin Feather Mask. Thanks. I love the Mask In White!